Double Sunsets: Are there Planets orbiting Binary Star Systems? Authors: Christian Thalmann, Silvano Desidera, Mariangela Bonavita, et al. A mention of a planet orbiting two stars immediately invokes two ideas for many physicists: firsly, the famous image of the double sunset of Star Wars’ fictional planet Tatooine. Secondly, and perhaps with more fear, the three-body problem comes to mind: it is impossible to analytically describe the motion of three mutually attractive bodies. In the solar system the problem is soluble via approximation, since the Sun is so much larger than anything else that each planet behaves roughly like it would in a two-body system, and ignores the other planets. If, instead, a system includes two large bodies and one small one, the gravity that the smallest body feels is very complicated and varies through its orbit. As such, this planet can easily be ejected from the system. And yet, the paper we’re looking at today is aiming to find exactly these types of systems: circumbinary systems with a planet orbiting a pair of binary stars (not to be confused with circumstellar systems, where a planet orbits one of the two stars in a binary, which have also been found). Circumbinary planets can sometimes exist if there’s a close binary and wide-orbit planet, which “feels” the binary as a single central star. Searching for wide, circumbinary planets is interesting since this is largely unexplored territory, with most Direct Imaging and Radial Velocity surveys deliberately aiming to avoid binaries due to the added complications these introduce in the detection process. Given that ~50% of sun-like stars have stellar companions, there are bound to be exciting things to discover! In fact, circumbinary planets may be more likely to lie in very wide orbits, since the binary system is expected to scatter the planets outwards, making them ideal Direct Imaging targets. Understanding the frequencies and properties of wide-separation planets may also help theorists to distinguish between the Core Accretion and Gravitational Instability formation theories. The SPOTS (Search for Planets Orbiting Two Stars) survey is the first survey targeting circumbinary planets with the Direct Imaging technique. Direct Imaging aims to do exactly what it says on the tin: detect exoplanets directly, by imaging the systems and picking up photons from the planet. This is tough, since even the brightest planets are at least 1000 times dimmer than their host stars, but separated by at most a few arcseconds, so the starlight completely floods any planets out. As such, sophisticated techniques are required to remove starlight, and in this case Angular Differential Imaging is used. This basically means that a large number of photos of the target are taken, and the telescope is moved slightly between each one. Most of the noise in the image comes from scattered starlight, diffracting of tiny mirror defects. So, as the mirror turns, the noise moves. Planets in the sky stay in the same place in each image – this difference in behaviour means noise can be modelled, and very effectively subtracted, without affecting the planet signal. This relies on the rotation of the telescope as it tracks a star across the sky, over a time period of ~1hr. Any noise associated with the telescope lens is stationary between images, while the planet appears to move, due to the telescope rotation. As such, over a sequence of images the “moving” and “stationary” sources can be distinguished. The images can then be combined so as to preserve the planets, but not the noise. So, Angular Differential Imaging requires that the light is very consistent from frame to frame. If there’s a second star further out from the center of the image, this second star will appear to move from frame to frame, just as a planet would. It’ll be in a different place in each image, i.e not consistent from frame to frame, and not subtractable. So, when I saw the title of this paper, my honest reaction was “but that’s impossible!”. After all, direct imagers usually try to avoid observing binary targets. However, the SPOTS survey team use two methods to get around the binary problem: firstly, in some cases, the binary stars are so close they appear in the same place in the images, and so rotate as one in the center of the image. Secondly, if one of the stars is much dimmer than the other, it’ll still get in the way – but not too much, so planets may still be detectable. So far, SPOTS has looked at 26 binary targets. Ten of these have candidate companions – a couple of these are shown in Figure 1. This rate of candidates is about the same detection frequency as in most surveys of single stars: this is a strong proof that imaging around binary targets is doable. The next step the authors take is to differentiate between planets, and distant background stars that just happen to lie near the foreground targets. To do this, the authors wait at least a year, and re-observe the same targets. Foreground stars generally have a large proper motion, or movement across the sky, and also move with parallax. The orbiting planet would be expected to move with the foreground star, while the background star wouldn’t. So, the two are distinguishable. 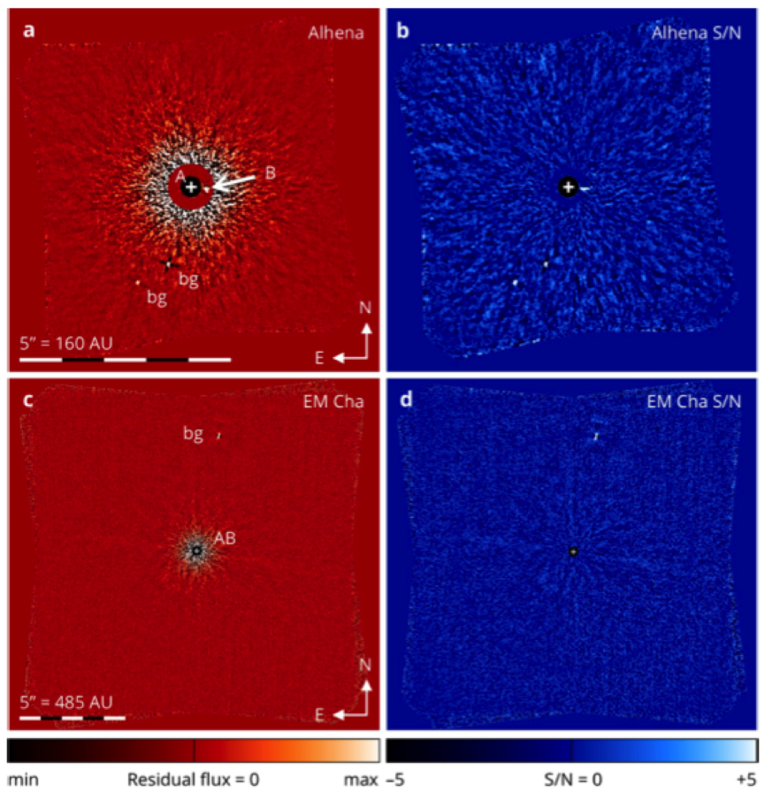 Figure 1: Four of the SPOTS survey images: (a) and (b) are of target Alhena while (c) and (d) are of EM Cha. In each case, the left image is the final reduced output, while the right hand side shows the signal to noise. Two candidates (labelled ‘bg’ in the image) are detected near Alhena, and the binary companion (labelled ‘B’) is also seen: the central circle has been attenuated by 1/1000 in the post-processing to make this visible in the image. In the lower case, a third candidate (labelled ‘bg’) can be seen. Although these candidates have all been shown to be background stars in the follow-up candidates, they would have masses of 29 and 45 times the mass of Jupiter (top) and 7 times the mass of Jupiter (bottom) if they were real. For now, the paper is unable to confirm any circumbinary planets: the follow-up observations have only been carried out for three targets so far, and in each case the candidate proved to be a distant star. The authors have follow-up observations planned for the remaining seven candidates planned though, and will also be looking at 41 more targets with the new SPHERE instrument at the VLT. So, they may well still detect a system akin to Tatooine. An Overview of the Extreme Solar Systems III Conference Is there anything out there? A search for the widest separation planets New Directly Imaged Planet Challenges Planet Formation Theories Where do most planets form?